This Sunday’s full moon is being touted as another “supermoon,” one of three that will occur by the end of January. The full moon is such an invitation to experience a sense of tuning into the earth. So on moon days I enjoy the luxury of the extra two hours I have--since I’m not doing an asana practice--and I sit longer those days to meditate. . . . Arrange the body. Heavy sitting bones, strong, easy spine, heart floating, palate released and the sensation of breath. Settle in. When you notice thoughts arise, citta vritis running rampant, smile and come back to the breath. The full moon always makes me feel really grounded. Or giddy sometimes. Often, I’m melancholy. This time, probably also partly due to a strong case of jet lag, I’m feeling pretty giddy. Oops, back to the breath. The full moon. Sitting. A supermoon! This is just another demonstration of progress that goes unnoted. When I was growing up back in the 1950s there were no supermoons. There was just the man in the moon. Of course, that was hotly debated by divergent camps of disbelievers, some of whom argued for there being a rabbit up there, with others (probably the gastronomes among us) convinced the face of the moon clearly revealed the fact that the moon was made of cheese. But then the mystery and the invitation for deep contemplation, and all of our speculations about the moon, were doused when on that hot summer’s night in late July of 1969 Buzz Aldrin first set foot on the moon. There wasn’t a man there, and even though the astronauts only had really bad dehydrated food and Tang to eat, they couldn’t find any cheese at all! Who names their kid Buzz? Smile; attention on the breath. They brought back “moon rocks,” material collected while they were poking around up there that day. Moon rocks were all the rage for a while. A friend of mine even got one, which her parents wouldn’t allow any of us to touch. Another sign of progress is that you can Google “moon rocks” these days. Which I did to find on Wikipedia that the true meaning of the words is, “Nuggets of the marijuana strain Girl Scout Cookies, dipped in hash oil and then sprinkled with kief.” Who knew? I was a Girl Scout back in the day and I didn’t even know this. I don’t even know what kief is, but I’m not going to Google that in case my Google searches are being monitored. And, no, my train of consciousness thought here in writing isn’t because I ordered and indulged in moon rocks when researching the topic. My mind just always churns up citta vritis, so I meditate to train it as best I can. How embarrassing. I’m always thankful there aren’t thought balloons above my head when I practice or sit. I’m sure everyone else’s mind is still while my mind races around like a monkey. Or rat. Sometimes I feel more like a rat. And then . . .
Come back to the breath again. No judgments. Which brings me to yet another sign of progress—that we can dispel or create modern myths so easily due to all the hard facts (or fake news, take your pick) available through Google itself, or better yet, through social media. For instance, on the topic of the moon, there’s a theory that the moon landing is a myth; that there never was a moon landing—check it out. I sat in the capsule that landed on the moon when we were visiting the Smithsonian. But, come to think of it, it did seem pretty normal and it wasn’t that beaten up. We have a twenty-year-old truck. Its paint is looking pretty weathered and the seats are losing their spring, and it’s just been tooling around here on earth. Imagine if I’d driven to the moon and back! You’re trying to convince me that it would look this good still? Of course, it would take a lot to coordinate a huge conspiracy like staging a moon landing—even though some of the shadows in the films from the moon landing weren’t quite right. The evidence of poor lighting shows clearly that the whole thing was staged or at least underfunded. Certainly it wasn’t because shadow angles and lighting are actually different on the moon than they are on earth due to some weird relationship of moon-earth-sun. Given that during last summer’s full eclipse the shadows were really wacky, there’s an outside chance lighting was different up there on the moon. Who knows? The thing is, to coordinate a long-lasting conspiracy about landing on the moon would mean to get agreement between and coordinate stories with so many people! If you’ve ever tried to organize a group project of any sort, you know how hard it is to get people to agree on and stick with anything. Plus, given that Doodle, email, Internet, FB and other ways of actually communicating didn’t even exist in 1969, how could there have been such an airtight, coordinated conspiracy? I don’t know. I try to see all sides of these tough arguments. But back to the breath . . . and the original point . . .
There’s going to be a supermoon on Sunday, which means that the full moon will occur at or near the Moon’s closest point on its elliptic path around the Earth. 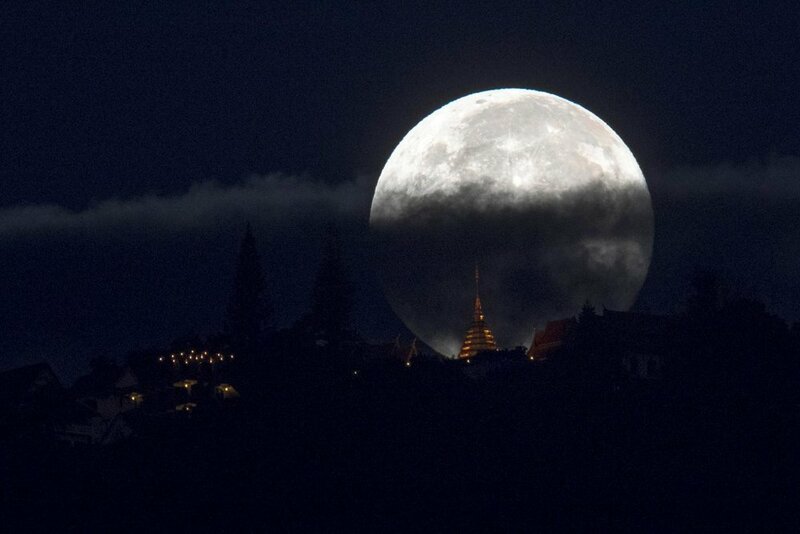 A supermoon looks bigger and brighter than usual because it’s a little closer than usual. That’s cool. Makes me feel like sitting. And then I remember that for us Ashtangis, any full moon is pretty cool. It offers a time to stop. To drop in and let the mind, body and spirit resynchronize, realign so our true nature can bubble back up. The moon days give us the opportunity to remember the contemplative aspects of our practice and how profoundly important they are. And that’s not a myth. That’s for real. Can Difficulties Give Us Insight?